The Stove Doctor has several specific techniques and specialized equipment that have been developed to keep your heat source in good working order. We stock lots of parts to avoid second trips and keep the cold time to a minimum for you. Our business is centered around proper maintenance. Not only do we offer professional cleaning services for your pellet, wood, or gas stove, we strive to educate you on anything you can do yourself to make your appliance work better. We do not sell stoves directly, but have good working relationships with most all of the stove retailers in the area and are happy to be involved in helping you decide which appliance will work best for your specific needs. If you need the product installed, you will find two things from us. 1: we are rarely the low price leader. We do not cut corners and are keenly aware of the need for safe, secure installs. We price reasonably, and work very hard to do the job right. 2: Once you have purchased your stove, and hired us, you can relax. We will take it from there. We handle obtaining the proper permits, perform a pre-site at your location to address any specific details or questions you may have before the install. 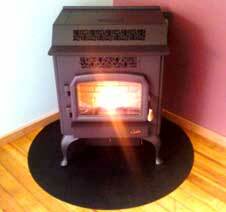 We pick up the stove from your dealer of choice and handle the install start to finish. The one thing we always want to know is: How may we help you? We can fix your heating stove - All Brands. The Stove Doctor strives for your safety first. We make the unknowns into knowns. Many times customers have said at the end of a simple product safety inspection, (whether the outcome was no problems found, or something major to correct) “now I know and I feel better”. 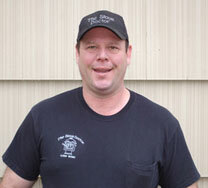 The Stove Doctor is family owned and operated. Not part of a huge corporation where you are a number, not a name. We have several customers that have been with us since our beginning. We are honored to service their heating appliance every year. Our customers are very loyal, as we are also very committed to their continued safety and satisfaction. 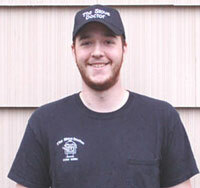 The Stove Doctor has been structured around customer service, and we are well known for it. Whether you need a quick piece of technical advise over the phone, a chimney inspection or have a complicated problem that no one else has been able to help with - The Stove Doctor will do our very BEST to take care of you. 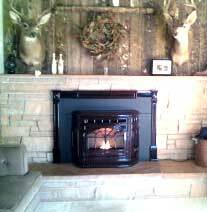 Fireplaces are either masonry or zero-clearance (sheet metal) units. They are totally different with regard to repairs and maintenance. We work on both. A masonry fireplace is built of brick. The fireplace itself will have a firebrick liner inside the combustion chamber and depending on the age, will have a clay flue tile liner in the brick chimney. In contrast, a zero-clearance fireplace is constructed of sheet metal and usually has a refractory lining in the combustion chamber. Its chimney is usually comprised of sheet metal sleeves that fit one inside the other. Repairs for masonry fireplaces fall into two groups. The first is fire related. This would include replacing firebrick in the combustion chamber, welding up cracks in a heat form, or replacing clay flue tiles. The second type of repair is when water gets involved. We live in a rain forest. Water damage is a quiet type of destructive force that, over time will destroy a masonry chimney. Although we are not masons and cannot rebuild your chimney from scratch, we do lots of repairs to crowns, and install caps to keep water from damaging the brick and clay flue tiles. Maintenance is the same for masonry and zero-clearance units. 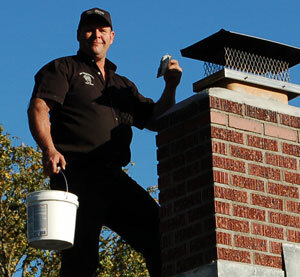 We need to keep the chimney clean to avoid chimney fires. 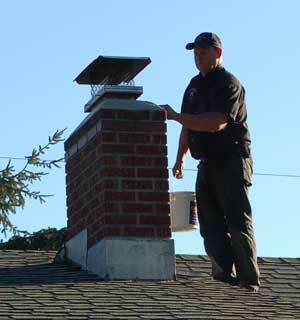 We do complete safety inspections of the unit and the chimney before we sweep them. Then we do a second chimney inspection after the sweep to look for any damage that might have been hiding under the soot and ash. Masonry chimneys are also susceptible to water damage. We take care of them by removing the moss and then water sealing the brick and mortar joints with industrial grade water sealer. We also apply an elastic coating to the crown to stop any frost wedging cracks from opening up and allowing water to damage the brick from the inside out. We are OSCA certified chimney sweeps and take your safety very seriously.